Spring Valley MN – May 24, 2014: (Photo courtesy of Gulbranson Photo) Finally a perfect day for racing action at “the Creek” with a mid-70’s temp, a light breeze and 138 cars filling the pit area, what a way to spend a memorial day weekend. 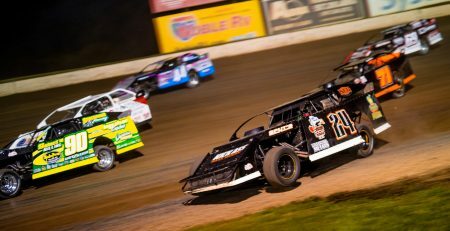 Tonight was the annual A&A Electric & Underground Southern Minnesota Spring Challenge featuring the stars of the United States Modified Touring Series along with the USRA Iron Man Stock Cars, B-Mods and the WISSOTA Super Stocks and Street Stocks. The first feature on the track was the Six Two Graphics WISSOTA Street Stocks. Shaun Mann jumped out to the early lead with Nathan Schumacher moving quickly into second. Mike Blowers, Derek Kilby and Troy Voth were three wide for third early on. The next lap Blowers powers out and took the second spot away from Schumacher. A caution on lap six bunched the field back up. Mann led on the restart with Blowers all over him. With eight down the two were side by side for the lead at the line. Blowers took over the lead on lap nine while another caution on lap ten slowed the field as Bernie Adams slowed with a flat causing a stack up behind him. On the restart Blowers led with Mann in second. Nick Schwebach, Jason Barber and Kyle King were three wide for the fourth spot. Voth continued to sit in third and caught up to Mann as he started to pressure Blowers for the lead again. With thirteen down as Mann and Blowers battled for the top spot, Voth moved up high and blasted around the duo to take the lead away from them. Barber saw the move and quickly followed through into second and Blowers car seemed to start slowing. The final caution came out as Barber lost the handle on his machine in turn one as he pressured Voth for the lead. Voth led on the restart but as the white flew over the field Mann had pulled alongside. Going into three Mann drove it in hard and the car stuck completing the pass and taking home the checkers. Voth, King, Schwebach and Kory Adams rounded out the top five. Heat races were won by King, Blowers and Mann. An incredible field of USRA B-Modifieds was on hand for the Iron Man Challenge race with 40 cars on hand. Matt Jones jumped out to the early lead with Cory Crapser and Cole Queensland racing for the second spot. With two circuits completed Jones, Crapser and Queensland were three wide for the lead at the line. Crapser led lap three as a caution flew over the speedway. Crapser led on the restart with Queensland pressuring him; Jones and Alex Williamson were also in a heated race for the third spot. Williamson took the third spot as Queensland continued to race hard with Crapser. With eight down the race up front was still going strong but Crapser had the preferred line and slowly started to pull away after the first ten laps. Crapser took home the win with Queensland, Williamson, Jacob Bleess and Jones in rounding out the top five. Dustin Sorensen and Brandon Hare won the pair of “B Features” while Queensland, Williamson, Erik Kanz, Dustin Kruse and Jones won the preliminary heat races. Dave Solum led at the start of the Wagner Trucking WISSOTA Super Stock feature event with Gary Wiersgalla and Kevin Hager racing for second. Wiersgalla took the spot and on lap two worked past Solum for the lead. With three down Hager worked into the second spot with Solum now in third. Two laps later Brauer worked past Solum for the third spot and Brian Fetting took over the fourth spot on lap six. With seven down Brauer and Fetting battle for the third spot, Fetting took control of the spot but on lap ten the two were battling again. Brauer took over the spot and then on lap twelve he worked past Hager to take over the second spot. With sixteen down Fetting worked past Hager for the third spot while up front Brauer was all over Wiersgalla now for the lead. On lap eighteen Brauer took over the control of the race. At the finish it was Brauer with the win, Wiersgalla, Fetting, Hager and Brandon Duellman rounded out the top five. Heat races were won by Fetting and Wiersgalla. 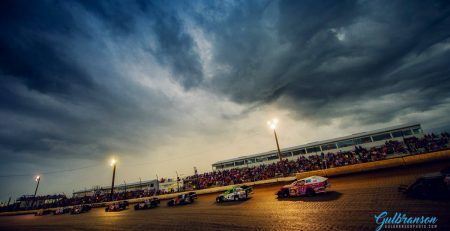 The final race of the night was the forty lap United States Modified Touring Series race. Brad Waits used his pole position to his advantage and jumped out front early on. Steve Wetzstein sat in second with Derek Ramirez in third. Joey Jensen and Joel Alberts battled for fourth early on. Alberts took over the fourth spot and was running a slightly higher line than the front three. Alberts slowly gained ground as Ramirez worked alongside of Wetzstein on lap eight. On lap nine Alberts joined the battle as they were three wide for the second spot. Alberts took the spot with Ramirez hanging onto the third spot. With ten complete Stormy Scott moved past Jensen for the fifth spot and on the next lap took over the fourth spot as he moved past Wetzstein. Jensen moved past Wetzstein for fifth on lap fourteen while Alberts and Ramirez was now battling for second again. Alberts higher line kept his momentum up just enough to hold onto the second spot. On lap twenty nine the race for second heated up with Alberts, Scott and Ramirez three wide for the spot. Alberts continued to hold the spot with Scott now credited with third. With nine laps left Jensen worked past Ramirez for the fourth spot. With three laps left Scott was all over Alberts again and this time was able to make the pass for the second spot. Up front though it was all Mr. Waits as he cruised home to the win followed by; Scott, Alberts, Jensen and Ramirez. “B-Feature” races were won by Craig Thatcher and Scott. Heat race action was won by Wetzstein, Nate Wasmund, Waits, Jensen and Alberts. “B-Feature 2” – Hare, Boumeester, Kath, Timmerman, Wytaske, Clement, Kadden Kath, Anthony Condit, Charlie Steinberg, Greg Erickson, Jesse Baer, Russ Quinnell, David Pitz, Kenny Boge JR.
Heat 3 – Schmitt, Webb, Staley, Masters, Panos, Toot, Scherf, K. Vogt. Sponsors step up, add $30,000 to WMDTC purse!